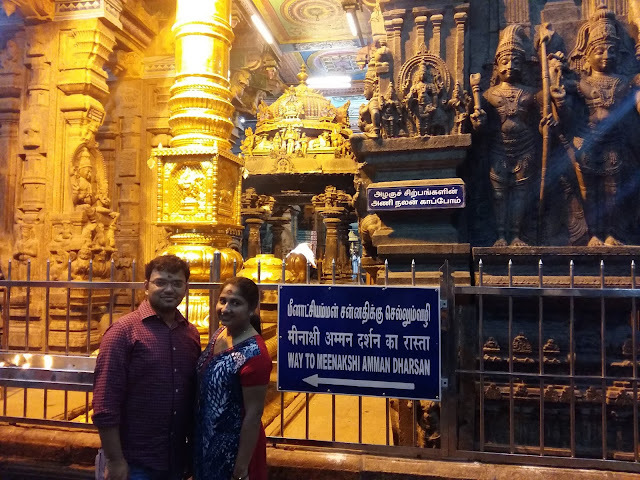 As part of the grand South Indian tour, our next destination was Madurai. We returned from the Pamban island trip - covering Rameshwaram, Dhanushkodi and Pamban Bridge - and reached Madurai late in the evening and we had decided that we would focus on covering primarily the Meenakshi Temple - the pride of the city. As per plan, we headed straight to the temple after entering the city rather than checking into the hotel. The car negotiated the narrow roads across the city and dropped us at the Temple entrance at about 6:30 PM. Madurai District is situated in the South of Tamil Nadu state. It is called as Thoonga Nagaram that means a City that Never Sleeps. 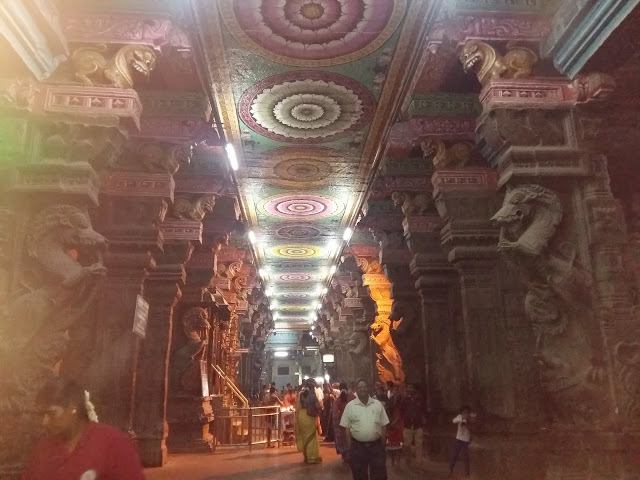 The holy temple town Madurai - apparently named for the nectar that flowed from Shiva's hair as a blessing for the new city (madhuram is the Tamil word for sweetness) - was built by the Pandyan king Kulasekara. Situated on the banks of river Vaigai, Madurai has a rich cultural heritage passed on from the great Tamil era more than 2500 years old. The oldest living city in the Indian peninsula, it was the capital of a kingdom that ruled much of South India during the 4th century B.C. and conducted trade as far afield as Greece, Rome, and China. Madurai was an important cultural and commercial center even as early as 550 AD. It is also famous for its trademark Chungudi cotton sarees, color dyeing, motifs, Handicrafts, Brassware. The Meenakshi Amman temple is the city’s most important landmark. It is one of the five sabhas [divine dance stages] called as Velli Ambalam [silver Hall]. The Meenakshi Temple complex is literally a city - one of the largest of its kind in India and undoubtedly one of the oldest too. The temple which has five entrances, covers an area 847 feet (254.1 meters) long and 792 feet (237.6 meters) wide in the North-South direction, the circumference of the Adi Veedhi which is the path within the great walls is 830 feet (249 meters) on the east-west and, measuring 730 feet (219 meters) from North-South direction. The temple grew with the contribution of each dynasty and victorious monarchs, into an enormous complex extending over an area of 65000 Sqm. The temple first came in to being 2000 years ago and was substantially expanded during the regime of Thirumalai Nayak(1623-55 AD). 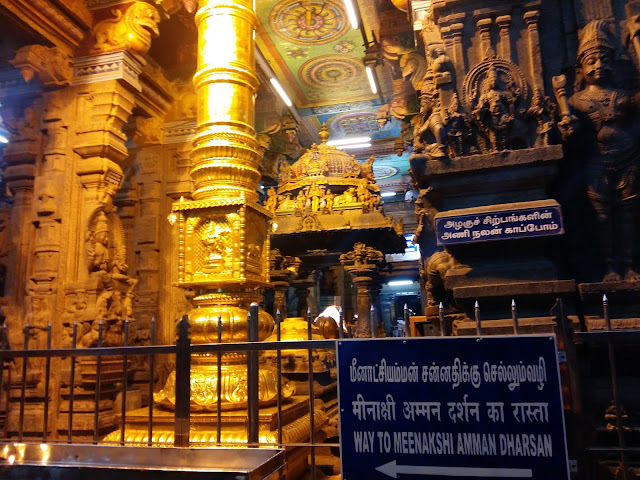 The temple has four Rajagopurams or majestic towers, there are five towers on top of the sanctum sanctorum of the Lord, three on top of the sanctum sanctorum of the Goddess and two golden towers or gopurams, all which have been exquisitely designed and sculptured. We entered the temple after cleansing up a bit with droplets of water and removing our footwear. One interesting fact about the temple is that it is one of the few temples in the state that allows entry in non-traditional dresses. We moved into the temple and delved into the spiritual devotion. 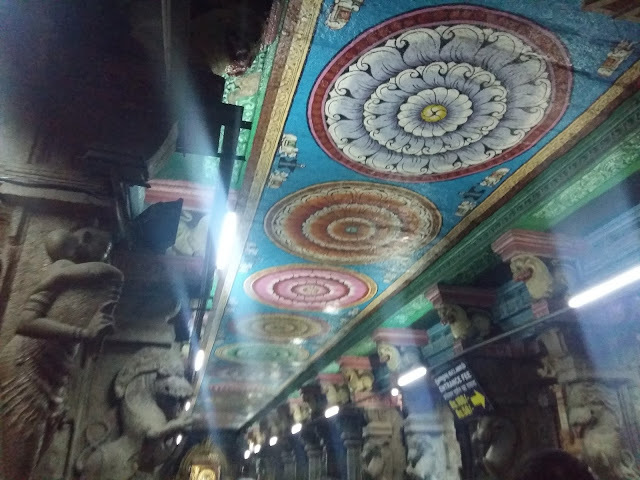 As we entered, we found ourselves in a hall with a statue of eight goddesses called the Ashta Shakthi Mandapam ("Hall of eight goddesses"). We continued our journey through numerous halls and corridors. 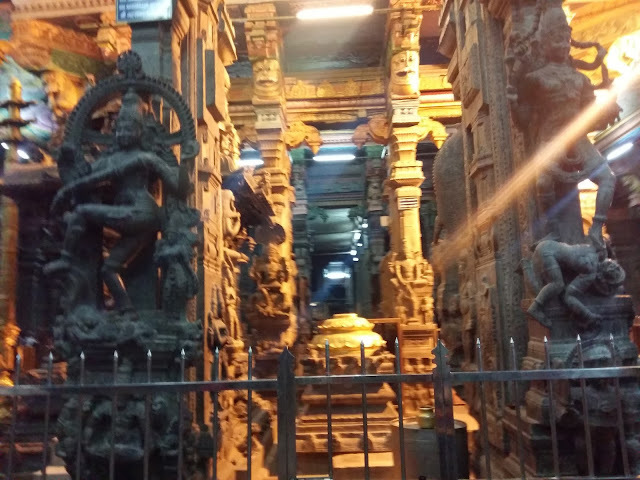 The corridor surrounding the sanctum the Meenakshi is called kilikoondu Mandapam ("birdcage corridor"). Space was once used to keep green parrots that were trained to utter the name of Meenakshi. There are two large cages full of squawking green parrots. 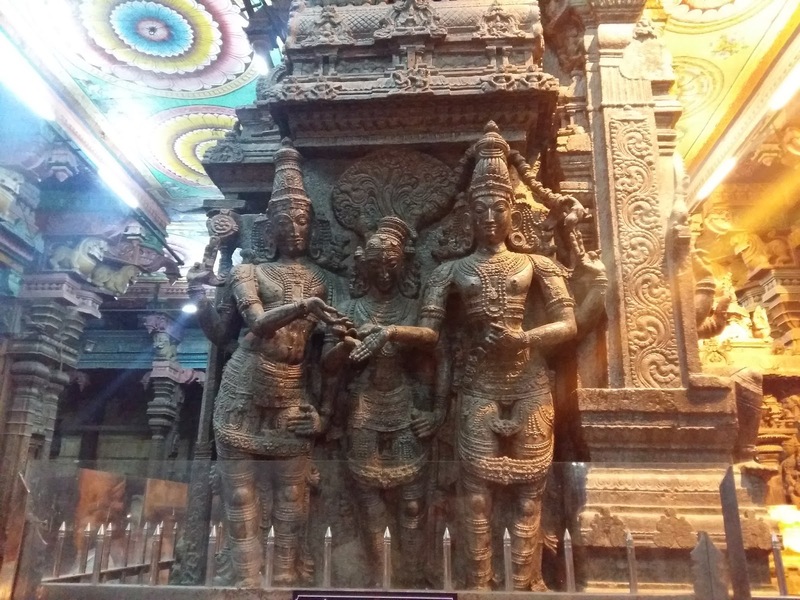 Lord Siva in his incarnation as Sundareswarar and his fish-eyed spouse, Meenakshi, are enshrined in this twin temple. There are four massive gateways enclosing these two shrines. Even a casual visitor is fascinated by the many paintings and sculptures. A striking feature of the temple is the astonishing structure know as “Ayiramkaal Mandapam” or the Hall of Thousand Pillars and each pillar features high, ornate, bold sculptures that look lifelike. View from any angle these pillars appear to be in a straight line, an architectural masterpiece indeed In the outermost corridors are situated the matchless musical pillars carved out of stones. When it is tapped, each pillar produces a different musical note. We spent over an hour and a half in the pious surrounding under the blessings of the goddess and had the prasadam. After resting there for a while, we proceeded to our hotel for a good night's sleep. Next day was going to be a busy one with an early start and we were geared up for our last destination of the trip - Kodaikanal.